This simple rectilinear drystone leacht lies to the west of the women's graveyard. There are no round cursing or curing stones present on the altar. Standing erect on top is a beautifully carved cross slab. 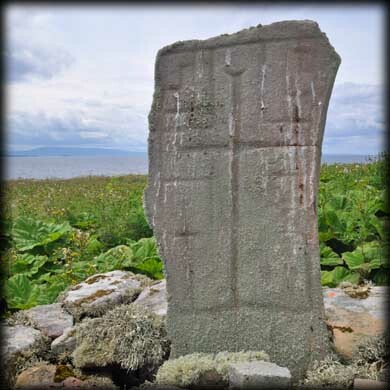 It is decorated on both sides with cross carvings typical to Inishmurray. Because of the superb condition of this slab and the one at Crossatemple my first impression told me that they were replicas, but both of these slabs are original. The slab is just under a metre in height and less than a metre wide. The east face, pictured right, is inscribed with a rectangular frame, with an incised cross rising from the bottom centre terminating into broad serifs. In the lower quadrants are two more incised crosses. 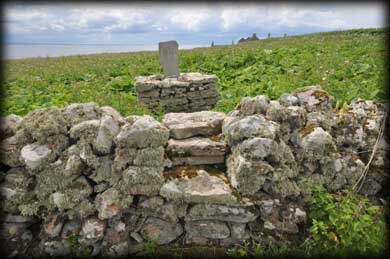 Access to the leacht is via a stone stile, see image below. Further south of the altar is a gorgeous cross inscribed holed stone positioned next to the wall surrounding the women's graveyard. This stone is very similar to the Birthing Stone. See Templenaman for picture. Situated:This leacht is located outside the women's graveyard on the western side. Discovery Map 16: G 5744 5379. Last visit June 2012.